That’s why we created ATLAS. It’s a delicious “weight gainer” (meal replacement) supplement that provides you with 38 grams of high-quality whey and casein protein per serving, along with 51 grams of nutritious, food-based carbohydrates, and just 6 grams of natural fats, as well as 26 micronutrients, enzymes, and probiotics that help you feel and perform your best. What it’s not, though, is cheap, so if you’re concerned about the price, I understand--you can get a weight gainer supplement for a bit less. Remember that you get what you pay for, though, so generally speaking, the cheaper a supplement is, the less effective the formulation. Place your order now and if you don’t absolutely love ATLAS, just let us know and we’ll give you a full refund on the spot. No complicated forms and no return necessary. You really can’t lose, so order now and get ready to build muscle and lose fat as quickly as possible and improve the nutritional quality of your diet. whey protein isolate and micellar casein. 1. They’re the premier fast- and slow-burning protein powders on the market. 2. Research suggests that a blend of fast- and slow-burning proteins may be more conducive to muscle and strength gain than either individually. Whey protein is a liquid byproduct of making cheese, and whey protein isolate is a form of whey that’s been processed to remove the fat and lactose. Whey protein isolate is at least 90% protein by weight, so you know that you’re getting something very close to pure protein with minimal carbs and fats. Furthermore, the whey isolate in ATLAS is made from exceptionally high-quality milk from small dairy farms in Ireland, which are known for producing some of the best commercial milk in the world. Casein is another protein found in milk. It's what forms the curds in cheese production. Micellar casein is a form of casein that’s carefully processed to preserve its natural structure, which is comprised of five types of proteins (alpha, beta, gamma, delta, and kappa). The primary benefits of micellar casein over cheaper varieties are it digests slower and thus is more satiating, it has a higher amount of protein by weight (it’s basically pure protein), and it generally tastes better. 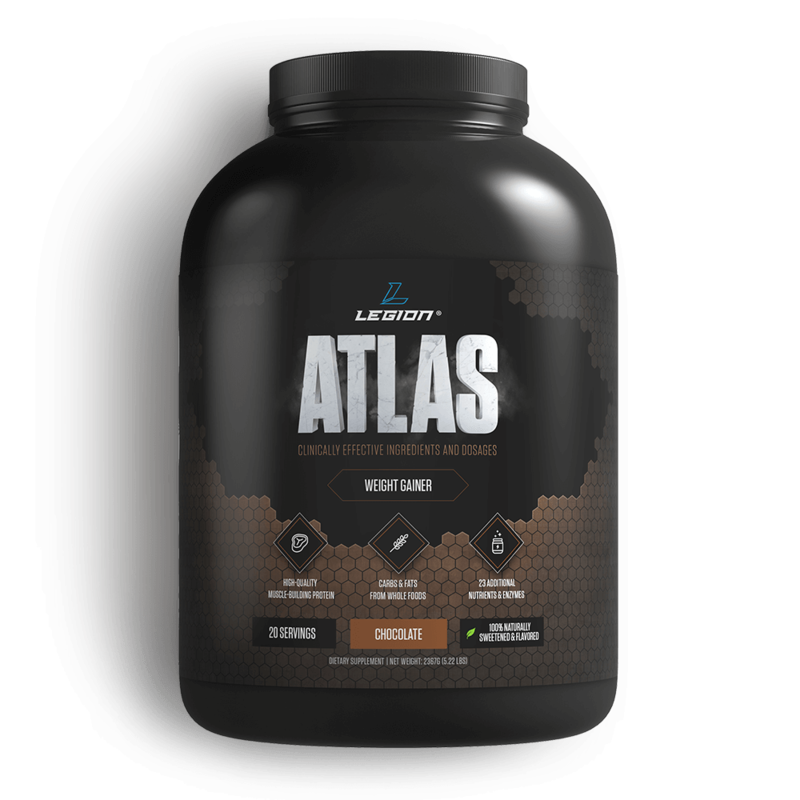 ATLAS CONTAINS 19 GRAMS OF WHEY ISOLATE AND 19 GRAMS OF MICELLAR CASEIN PER SERVING. Starch is a type of carbohydrate produced by most green plants as an energy store, and potato starch is exactly what it sounds like—starch extracted from potatoes. Potatoes are one of the most nutritious foods that you can eat, making potato starch a good source of vitamins, minerals, and fiber. It’s also a good source of resistant starch, which is a special type of starch that’s associated with various health benefits, including improving gut function, insulin sensitivity, and blood sugar control. It’s readily absorbed and rich in glucose—the simple sugar that is your body’s primary source of fuel—but doesn’t spike blood sugar levels, meaning it provides a boost of energy without a crash. It improves the consistency and mouthfeel of the supplement, making it more enjoyable to drink. The oat grain might not be considered as much of a “superfood” as some fruits and vegetables, but it’s no pushover, either. To start, oats are more nutritious than most other grains, providing an abundance of several vitamins and minerals like manganese, vitamin B1, and magnesium. They’re also rich in a molecule known as beta-glucan, which is a carbohydrate that forms the cell walls of cereals, bacteria, and fungi and is known to lower cholesterol levels and support gut health. Furthermore, oats are a good source of both insoluble fiber, which is highly beneficial to gut health, and the powerful antioxidant phenolic acid, which helps prevent the buildup of free radicals in the body. Lastly, similar to potato starch, oat flour is digested and processed slowly, preventing the blood sugar spikes and crashes that accompany most weight gainers. Eating the right types and amounts of dietary fat is an important part of optimizing your health and performance. No supplement alone can accomplish this, of course, but it can help (or harm) the balance of your overall intake. That’s why we’ve chosen to include several grams of fat from flaxseed and coconut in each serving of ATLAS. We chose flaxseed oil because it contains powerful antioxidants and alpha-Linolenic acid, a fatty acid that can be converted within the body to two other fatty acids vital to health: eicosapentaenoic acid (EPA) and docosahexaenoic acid (DHA). We chose coconut oil because most of its fatty acid profile consists of medium-chain triglycerides, which are more readily converted into usable energy and less readily stored as body fat than the types of triglycerides found in most foods. By its very nature, a meal replacement or weight gainer is meant to replace a significant portion of your daily calories that would otherwise come from food. Thus, it’s important that such a supplement provides more than just protein, carbs, and fats. It also should provide essential vitamins, minerals, and other micronutrients that your body needs to stay healthy, vital, and free of disease and dysfunction. That’s why we’ve fortified ATLAS with 21 different micronutrients that many people are deficient in and that are especially important to those of us who live physically active lifestyles. These additions range from the basics, like vitamin D, zinc, and magnesium, to several less commonly included in weight gainers, like vitamin K, inositol, and taurine. We’ve paid close attention to dosages as well, ensuring that you won’t get too much or too little of what you need. Digestive enzymes are substances naturally produced in the mouth, stomach, and intestines to help break food down into usable nutrients. Probiotics are live bacteria and yeasts found naturally in your body that support gut function and health. Many types of bacteria are classified as probiotics, but most fall into one of two groups: Lactobacillus, which are found in yogurt and other fermented foods, and Bifidobacterium, which are also found in some dairy products. Scientists are still determining exactly how probiotics work, but research suggests that probiotic supplementation can be particularly beneficial for people with certain conditions like irritable bowel syndrome, inflammatory bowel disease, and colic and for the prevention of infectious and antibiotic-related diarrhea. We’ve included three probiotics in ATLAS—Lactobacillus acidophilus, Lactobacillus casei, and Bifidobacterium lactis—because no matter how well you eat or how healthy your gut is, your stomach will never be able to fully digest and absorb every calorie that you eat. Some portion of every meal will always make it to the large intestines undigested, where it can ferment, causing gassiness and discomfort before it is eliminated as waste. When you add probiotics into the mix, though, those organisms eat up the undigested remnants, turning them into various substances that benefit your digestive system and thus your entire body. This is why probiotics promote general health and work best when they have a lot of food to “feed” them. We’ve also included two digestive enzymes—bromelain and fungal lactase—because the more calories you eat, the more energy your body must spend on digesting them—energy that must be diverted from other physiological processes, like muscle building. Thus, by making digestion more efficient, it allows other biological processes to run more efficiently. We chose bromelain because it helps your body digest protein more efficiently, which aids in muscle building. We included lactase because it assists in digesting the sugar found in dairy products (lactose), which can cause gastrointestinal stress in many people. As a dietary supplement, mix 2 scoops of Atlas with 20 ounces of cold water or your favorite beverage. Vary the amount of liquid to achieve desired consistency. 21. Splenda alters gut microflora and increases intestinal p-glycoprotein and cytochrome p-450 in male rats. 22. What made Canada become a country with the highest incidence of inflammatory bowel disease: could sucralose be the culprit? 23. Consumption of artificial sweetener- and sugar-containing soda and risk of lymphoma and leukemia in men and women. 24. Fueling the obesity epidemic? Artificially sweetened beverage use and long-term weight gain. 25. Artificial sweetener use among children: epidemiology, recommendations, metabolic outcomes, and future directions. 26. Gain weight by “going diet?” Artificial sweeteners and the neurobiology of sugar cravings. 27. Steviol glycosides from Stevia: biosynthesis pathway review and their application in foods and medicine. 28. Antioxidant, anti-diabetic and renal protective properties of Stevia rebaudiana. 29. Safety evaluation of certain food additives. 30. Effects of Stevia rebaudiana (Bertoni) extract and N-nitro-L-arginine on renal function and ultrastructure of kidney cells in experimental type 2 Diabetes. 31. Toxicological significance of azo dye metabolism by human intestinal microbiota. 32. Effects of tartrazine on exploratory behavior in a three-generation toxicity study in mice. 33. Artificial food dyes and attention deficit hyperactivity disorder. 34. Meta-analysis of attention-deficit/hyperactivity disorder or attention-deficit/hyperactivity disorder symptoms, restriction diet, and synthetic food color additives. 35. Food additives and hyperactive behaviour in 3-year-old and 8/9-year-old children in the community: a randomised, double-blinded, placebo-controlled trial. 36. Prolonged use of the food dye tartrazine (FD&C yellow no 5) and its effects on the gastric mucosa of Wistar rats. 37. Effect of food azo dye tartrazine on learning and memory functions in mice and rats, and the possible mechanisms involved. 38. Effect of food azo dyes tartrazine and carmoisine on biochemical parameters related to renal, hepatic function and oxidative stress biomarkers in young male rats.